Full Game Coverage Haniger set a career high with the five hits, one shy of the club-record six in a game by Raul Ibanez in a 2004 contest in Anaheim. Haniger's three doubles also tied a Mariners single-game record. He's just the 14th MLB rookie since 1901 with five hits and three doubles in the same game and the first since 1977. "I'd like to do that every night, but unfortunately in this game, it's real tough," Haniger said. "A lot of times luck comes into play, too. You line out here and there, but luckily tonight I hit it where guys weren't." It helps when you hit five balls square on the nose. Three of his hits had an exit velocity of 102.9 mph or higher, including 111.2 on his final scorched double, according to Statcast™. "Every single one of them was hit pretty well," said third baseman Kyle Seager. "He looks really good. He's been swinging the bat really well all year. He's been very impressive, his professionalism as well. He goes about his business and knows what he wants to do. You don't see that with a lot of guys in their first full season." The Mariners charge back in the 8th inning and score five runs, highlighted by Kyle Seager's go-ahead, three-run homerIt's all setting up as a pretty remarkable finish for the youngster, who got off to a blazing April start when he was hitting .342 until straining an oblique muscle, then struggled through a couple other tough injuries and some rough times at the plate as his average dipped to .240 on Aug. 28. Since then, however, Haniger has been back on the top of his game and looking more like the all-around standout the Mariners thought they had early in the year. He's hit .378 (45-for-119) over the last 28 games, with 10 doubles, a triple and eight home runs. All of which brings a smile to the face of manager Scott Servais, who believed in Haniger from the first day he started working with him in Spring Training. "What a night," Servais said. "Five-for-five with three doubles and he smoked every ball. Really impressive. He's in a groove and it's kind of what we saw in April. He's one of those guys that can ride the wave. Some guys can ride it for two days, he seems to be ride it for like a month. "He's been outstanding all month and I'm really happy for him, battling the injuries this year. He is fresh. You can tell he missed some time during the year and has a little more energy in his legs and the bat obviously. Great way to end the season for him." Things were looking bleak for the Mariners on Saturday night as they trailed, 4-1, going into the eighth, but Haniger kept chipping away. 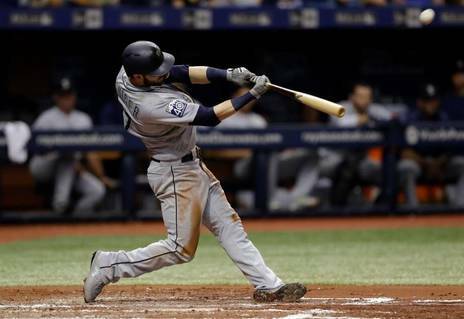 His fourth hit of the night, a single to right field, led off what turned into a five-run rally as Seattle jumped on reliever Cam Bedrosianfor five straight hits and five runs to take a 6-4 lead. Haniger doubled in the first, but got thrown out at the plate by Mike Trout on a Robinson Cano single to center. He also singled in the third and doubled in the sixth and ninth. 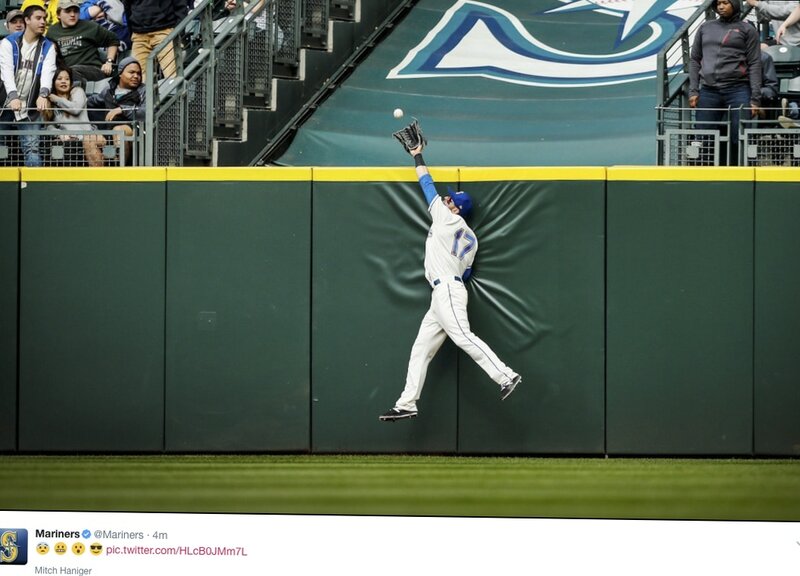 "It's awesome," Haniger said. "Sometimes you don't even have the opportunity to do that. It's been good to just try to finish strong." Greg Johns has covered the Mariners since 1997, and for MLB.com since 2011. Follow him on Twitter @GregJohnsMLB. This story was not subject to the approval of Major League Baseball or its clubs. GRAND SLAM! welcome back Mitch! Haniger - 3/4 and a walk as the M's crush the A's April STATS!!!! THIS KID IS ON FIRE!!!!!!!!!!!! 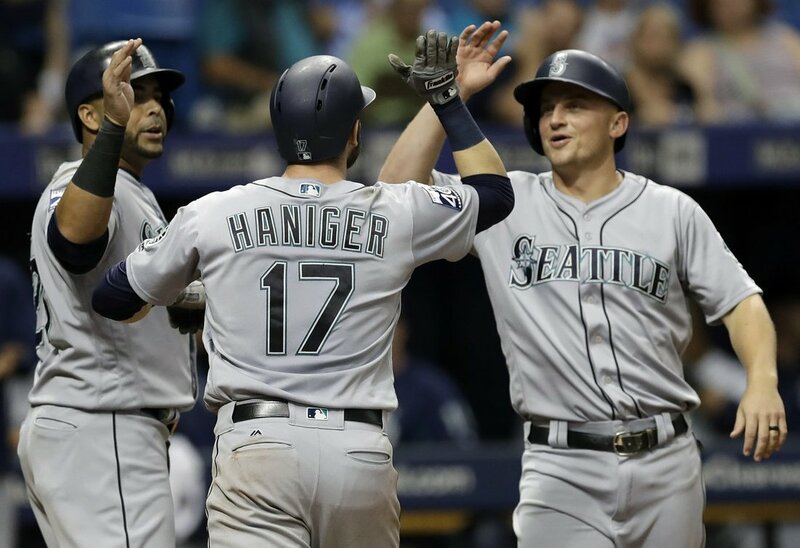 Rookie keeps rolling: Haniger has been a highlight for the Mariners in the first two week, and he stretched his hit streak to 10 games with a three-run blast off Hamels, a 407-foot shot to left-center in the third to cut Texas' lead to 6-4. The 26-year-old right fielder leads Seattle with four homers and 10 RBIs, all coming during the 10-game stretch in which he's batted .359 (14-for-39) after Sunday's 1-for-3 with a walk. Haniger also went up over the wall to rob Joey Gallo of a home run in the eighth and keep the score tied at 6.